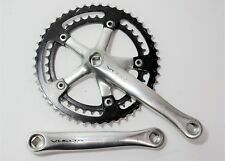 Shimano Vuelta JIS 170 mm alloy crankset 48/39 tooth rings, threaded 9/16 X 20 TPI. We respect your privacy. We do not share information with anyone.